Hello, I am sure this has been discussed before, but if you would indulge me. I am finally getting WWW tires for my 59 Sport Fury and think I will stay with radials,(unless someone can convince me bias are good in the rain and with moderate driving). Mainly, I wanted everyone's opinion on the American Classic, Bias look, radial tires. Also, where is the best place to purchase them? I want to start taking my SF on trips and am concerned the Calli and Diamondbacks may leach into the whitewalls. Some have said they turn brown after a couple of years. Any help is appreciated. Location: So. California I have seen them turn brownish over time, but you can always whitewash them again with sneaker whitener. Have you tried using Cali or Diamondback tires? Too weak shoulder resulting in grinding off the white wall close to the rim. I wouldn't dare to have them on my car - they just don't go together with active driving. Location: northern germany bought a set of diamond backs in 2004, no problems whatsoever. Are you guys speaking of American Classic or Coker tires? I did have Diamond Backs, but only for about a year. So not enough time to see if the white would turn brown. I plan on taking it on trips and can't be sure of the roads and turns, so I am unsure of bias safety. Ordinary "blackwall" radial tires with the proper load and speed rating of a good brand is the safe way to go, but of course, White wall tires gives the best look. bought a set of diamond backs in 2004, no problems whatsoever. I know many car owners that bought Cooker tires lately and most of them are not happy with the tires. A friend with a 74 Caddy had 3 Cooker out of 4 blew out on the highway - fortunately on different occasions. A carpenter friend of mine uses to say "you cannot buy good quality nowadays, no matter what you pay"
Location: So. California Sven, your anecdotal evidence has no application to Sid's experience. You can't compare apples to oranges. Everyone knows Coker (not Cooker) tires are complete crap. But Diamondback and Cali use standard name-brand radial tires and applies the whitewall to them. These must be evaluated separate from Coker because they aren't even similar to Coker's garbage product. Recently Coker came out with the American Classic radial that looks like a bias ply tire. Is it any good? Unless we have direct experience with this new tire, we have no idea. However, given Coker's track record of building and selling crap, the outlook is probably not real great. But as I said, this has nothing to do with Diamondback or Cali. Everything I have heard about Diamondback has been positive. 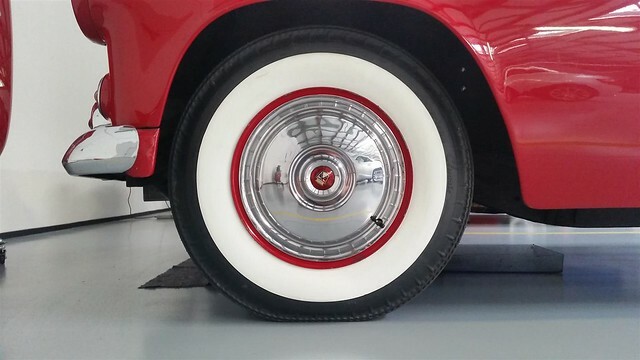 I have used Cali tires before, and the whitewalls do darken with age, but the tires are good. Location: Southern Sweden - Sturkö island I have no experience of the Cali tires and I don't know anyone that uses them over here. The problem with applying whitewalls to a modern tire apparently is that the black rubber discolors and when that happens, the white rubber gets mushy and soft. It would be good to get some reviews on the New American classics. With such a big request for whitewall tires I find it very strange that there isn't a quality product. With the miles you say you drive your car they must be pretty well worn by now. not for my fury, that requires high speed tires. bought the db's for my ex 61 desoto coupe driven by my ex girl when the car was still under my custody. had the 61 with these tires briefly up to 133mph. they gave a smooth ride and didn't need much wheel weights and until they were pulled (because they were more than 10 years old, in favor of coker tires, against my advise) showed no separation, yellowing, bubbling, cracks or anything. they basically looked like new, didn't even show much thread wear (even though i adjusted toe in and camber with home tools). had some problems with the sales person, but their product is great. Location: Victoria, BC, on Vancouver Island, Canada The issues I've had with Diamondback tires were the whitewalls getting blisters next to the rim. I've had this happen on every single DB tire I've bought except for one of the rears, and most of the warranty replacements, but it looks like they've finally figured out and solved the problem, at least for my tires. The latest set of tires that they have sent me have the whitewall bead trimmed back so that the whitewall doesn't get pinched under the rim when the tire is installed. Now with white trimmed back there is a very narrow band of black rubber visible between the tire and the rim when the tire is installed. The main issue was with the front tires which take the most stress from cornering etc. which caused the blistering on the whitewall next to the rim. There is absolutely no issue with the white discoloring on DB tires. They even mention on their web site that they have devised a process by which discoloring cannot happen by bleed-through from the black. There have been no issues at all with balancing, or tires being out of round etc, or blowouts. They told me that the problems I've had are very rare, and virtually no one else has complained. My reasoning for this is the fact that I drive the car a lot, and have put 31,000 miles on it in 10 years. This problem would not show up with someone who only drives their car to the occasional show, or trailers the car etc. On my tires the blistering started to happen after about 3000-4000 miles of driving or 2 years, for me, on all the front tires. So if you don't drive much, the blistering would take many years to show up. Location: Victoria, BC, on Vancouver Island, Canada On a related note regarding American Classics, three of my local friends here have them on their FL cars, and have had no issues at all. All three sets are P-235-75R14 on a 60 Polara, a 61 Chrysler and a 58 Imperial. The 60 Polara has had them on for quite a few years, and the car gets driven quite a bit. The 58 Imperial and the 61 Chrysler are owned by a Forum member here and he drives the cars quite a bit as well. I have, however heard horror stores about the Coker branded tires, but not about the American Classics even though Coker makes them. Location: Southern Sweden - Sturkö island Thanks' for kicking in Ian - that means that the Diamondbacks are one option - really hope so! Location: northern germany Ian, we also drove the car alot and i do not think that anyone ever cornered faster in a 61 desoto than i did but your car is a much heavier long wheelbase chrysler and i lightened up the front end by locating the battery in the trunk and with aluminum intake, water pump/hsg, carb and other modifications. at least we never had a problem with blisters in the whitewall. Thanks' for kicking in Ian - that means that the Diamondbacks are one option - really hope so! Diamondback still doesn't have a nice 14" whitewall tire, as in P225 or P235-75R-14 as they rely on another company making the tires. Apparently though, they are trying to bring a Bias-Look radial onto the market, like Coker is doing. So really your only hope for larger diameter 14" wide whites is one of the various Coker made brands. Location: Southern Sweden - Sturkö island Thanks' Ian, I run on 15" rims right now, but it would be nice to go back to the 14" rims with original hubcaps. The 14" tires offered right now are all too small in diameter. Location: NY & VT Does anyone make a modern 225/75r14 ww? I can't find one, and can only find that size in black Hankook Optimos that say Blem/Defective... I imagine they too have been discontinued and that these particular ones are leftover blems. I imagine it's only cosmetic or they couldn't sell them? Still, I'm a bit hesitant. I'd prefer modern tires and blackwall is fine with me... I was driving in the '60s, and while we had WWs on our '57, '59, '63 and '68 Ford wagons, a LOT of people used blackwalls at that time to save money. My next door neighbor, an electrical engineer at Westinghouse, had blackwalls on his '60 DeSoto FireFlite, '65 Polara, and '68 Newport. IMO they don't look all that bad, and they are certainly authentic. I'd take a modern and safe blackwall over some inferior repro vintage whitewalls any day! style is "spirited" these tires, with their tall sidewalls, might not be for you. When I wear these out I'll get another set. Location: Southern Sweden - Sturkö island Thanks' for sharing - they look really nice! same size, the Coker tires are wider. I have had the Coker tires since 2003. I usually drive the car locally, but have taken long trips. They now have about 20k miles on them. I never had any problems with them. Location: Minor Hill, TN To my fellow forward lookers if the tire shop offers nitrogen for your tires take it. Location: Southern Sweden - Sturkö island I've used nitrogen for many years now, reliable, same tire pressure no matter the outside temperature or high speed driving. I have American Classics Radials since 2012 on my Plymouth with no problems of any kind. I have the American Classics Bias Ply Look Radials since 2016 on my Tbird with no problems except they are always a bit flat where it sits on the ground. Asked the dealer about that and he said it is normal because of the width/height ratio. Both cars are not driven much, around 900 miles in a year. I don´t know any other sources or products for WW here in Germany than Coker or American Classic. Location: Wild Wonderful Okay, now I'm really upset. After my first trip down the Interstate, this is what my tire looks like now. Does this look normal to anyone? So far, I am not having any luck with the American Classics. Location: NY & VT Scary... I've had good luck with Hankook Optimo ww's, although they aren't authentic looking, they perform excellently, and cost around $75-80 each, a bargain. Not everybody wants to spend, or can afford, $1000 for a set of tires. I paid $240 shipped to my door for a set of 4 P215r75-14s. As a retired Biochemist I'd take issue with the importance or desirability of using Nitrogen in tires: the natural atmosphere is 78% Nitrogen already, along with small %s of other completely inert gasses - argon, xenon &c...so I seriously doubt there is any advantage to using pure Nitrogen, other than to the bank account of the snake-oil salesmen who push it. Location: Southern Sweden - Sturkö island Over here in Sweden, I don't pay anything for the nitrogene - there was an initial labor cost of $20 for to empty out and flush the tires and to fill them up. Rock steady tire pressure, no matter the outside temperature and less leakage are the benefits. Location: Chestertown, NY ( near Lake George) Maybe I got lucky, but the Coker supplied BF Goodrich wide whitewall radials on my previously owned 55 New Yorker were trouble free for 6 years of regular summer use. Location: Hilltown, PA "As a retired Biochemist I'd take issue with the importance or desirability of using Nitrogen in tires: the natural atmosphere is 78% Nitrogen already, along with small %s of other completely inert gasses - argon, xenon &c...so I seriously doubt there is any advantage to using pure Nitrogen, other than to the bank account of the snake-oil salesmen who push it." As a tech I'm familiar with the whole nitrogen thing, especially since it's become such a point of concern among vehicle owners. This all started quite a while ago when racing teams in various forms of motorsport discovered that changing tire pressures by as little as a few PSI could substantially affect the handling of a race car. Having learned this they began seeking a way to minimize that change - obviously you can't eliminate the pressure change caused by the wheel/tire heating up, but if you could control other variables it might make tuning the tire pressures easier. So those guys, being a clever bunch who understood that while air is mostly nitrogen, also understood there are lots of other things in compressed air which make it's properties unpredictable - things like oxygen, argon, carbon dioxide, various trace gasses, water, and oil. All in varying amounts depending on just where you got your compressed air from. So they thought "what would be a good source of a stable, consistent, and inexpensive gas to fill tires?" Well, here's the funny part. Many teams were already using compressed nitrogen to run their air tools in the pits. Why? Because its DRY - nitrogen processed and stored under high pressure in welding cylinders contains virtually no water. Because it's PORTABLE - a high pressure welding tank will run an air gun for a long, long time when the tanks storage pressure of 2600PSI is regulated down to the 80-90 PSI most impact guns use, and a tank requires no fuel, or attention, like a compressor would. Because it's INERT - blowing nitrogen all over the pit doesn't create a hazard. And because its INEXPENSIVE - the cost of a tank of nitrogen is nominal, and it is easily obtained from a welding supply house most race teams already deal with. SO . . . someone said, "Hey - we could just put the nitrogen in the tires. It's mostly what's in the tires already, it will be consistent, dry, and cheap. And we already have it!" And that is how race teams started using nitrogen in tires. In truth it provides more consistent pressure for two main reasons - first it's pretty much the same wherever you get it. And second,, it has almost no water in it. What few laypeople understand is that its the water vapor in the air that causes the largest irregularities in tire pressure change with temperature. As far as nitrogen staying in the tire better . . . well that's a bunch of hoo-ha someone made up to sell nitrogen to people who don't need it. As observed - air is 78% nitrogen. So if nitrogen really did stay in the tire better, then after some time all the other stuff would leak out, leaving only the nitrogen. And every time you top off the pressure, you'd be increasing the concentration of nitrogen until that was the only gas in the tire, so theoretically at that point you'd never add air again, right? Except it doesn't work that way does it? And as someone who works in a facility that fills EVERY tire with 100% nitrogen, I can tell you they still come back with the pressures low. Every time. All that being said - is nitrogen better? Sure, in some ways. If nothing else it eliminates a source of moisture, condensation, and corrosion, to the elements inside your tire/wheel assemblies, which probably helps protect the electronic packages used to make Tire Pressure Monitoring work. Do you, as a non-race driver need it? Eh - not enough to pay for it for certain, and probably not enough to even think about it. There are plenty of cars out there with TPM systems running regular air with no issues. Okay, now I'm really upset. After my first trip down the Interstate, this is what my tire looks like now. Well, I informed Coker about the defective tires. They sent a notice to have them picked up, by FedEx. still brand new tires, so they sent me a replacement for each. No money involved. Location: So. California That's good to know. I just bought a set of Cali whitewalls. I should get them today or tomorrow. They are going on my '60 New Yorker. We'll see what they are like. Location: Park Hills, KY Got any pics ? I’d love to see the calli . I’m looking for a set for my 60 Windsor. Thinking about the BFG like this one, but concerned about the 2 1/4 white wall. Really want to have 2.5 inch. Can’t bear to buy Coker or American classic. Location: So. California Sure, these are the 4" whitewalls, but you can purchase 3", 2.5" or 2". These actually measure around 3.75" because that's the limit on the sidewall of this particular tire. Location: Park Hills, KY I really want to try the BFG 950-14s. But I am afraid that they will be too big for my stock rims and wheel openings on the 60 Windsor. Location: So. California The tires on my car are 235x70x15 on 15x7" rims and they fit very well. I'm not sure what the stock width of a Windsor rim is, but my New Yorker rims look to be 6". Location: Southern Sweden - Sturkö island We learn something "new" every day, at least if we are openminded! Just read an article about bias ply tires and how they adjusted inperfections back then! They used a tire lathe and turned the tires round if they where out of round, then balancing the tires and that was "it". This makes me wonder if this is the solution for the "new" bias ply and radial tires? Unfortunately, I have no pictures on this "tire lathe" - if someone has, please post some here. Location: Alaska After spending over 20 years in the airline industry (mechanicπlot) I can tell you that 100% nitrogen has been used for a long time in tires and also in landing gear struts and accumulators. It's probably been used by the airlines before any other industry usage. The main reasons, it seems to hold more stable pressure, and it is inert so slightly less fire danger if a hot brake explodes a tire, and as already mentioned, it is dry. Remember, the landing gear is in an unpressurized area so at altitude it can be -60F or less. You don't want any moisture. IMHO putting 100% nitrogen in car tires is unnecessary and a waste of money. Location: So. California My tires are definitely yellowing at this point so that is certain, but no issues with driving. Great quality tires. The backspace I used was 4.25" on 7" rims which have an extra .25" offset. They seem to fit well.